These Roasted Halloween Vegetables are a fun and simple way to celebrate this October! With sweet potato jack-o-lanterns, beet root witch’s hats, and spooky potato ghosts, this is a simple dish with some major wow factor! Bring a large pot of water to a boil. Cut sweet potatoes and white potatoes in half, width wise, then drop into the boiling water. Boil for 5 minutes, then remove. Drop whole beets and carrots into the boiling water and cook for 5 minutes. Remove beets from water and cut them into ½ inch thick slabs, then cut out witch's hat shapes. We'll call the carrots witch's fingers and just leave them be. Set veggies onto a parchment paper-lined baking sheet. Drizzle with oil, sprinkle with salt, pepper, and rosemary leaves, and toss around to evenly coat. Crush garlic cloves with the flat part of your knife and scatter around the pan. Bake at 400 degrees F (204 C) for 1 hour, flipping the vegetables halfway through. When you have 10 minutes left, drizzle balsamic over the beets and honey over the carrots, then return to the oven. 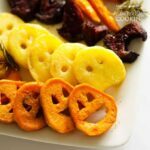 This recipe for Roasted Halloween Vegetables was printed from AmandasCookin.com - https://amandascookin.com/roasted-halloween-vegetables/ and can only be printed for education or personal use.